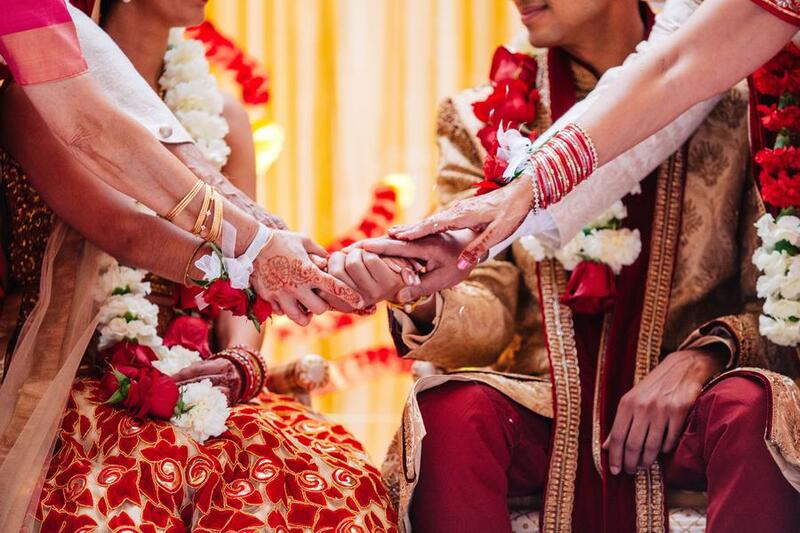 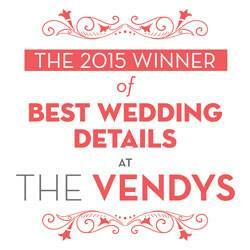 Every single wedding is special, and we can never get enough of them! 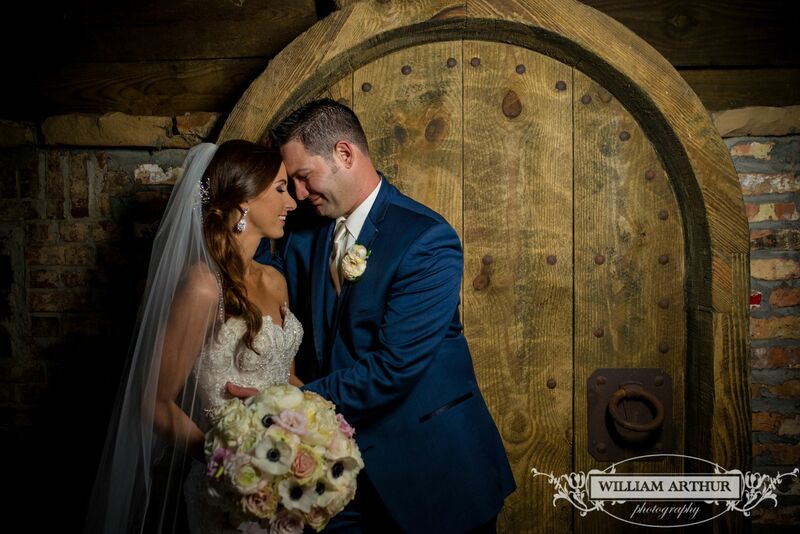 Katelynn and Kyle’s Bella Collina wedding was just gorgeous, with beautiful pops of crimson and merlot throughout the ceremony and decor. 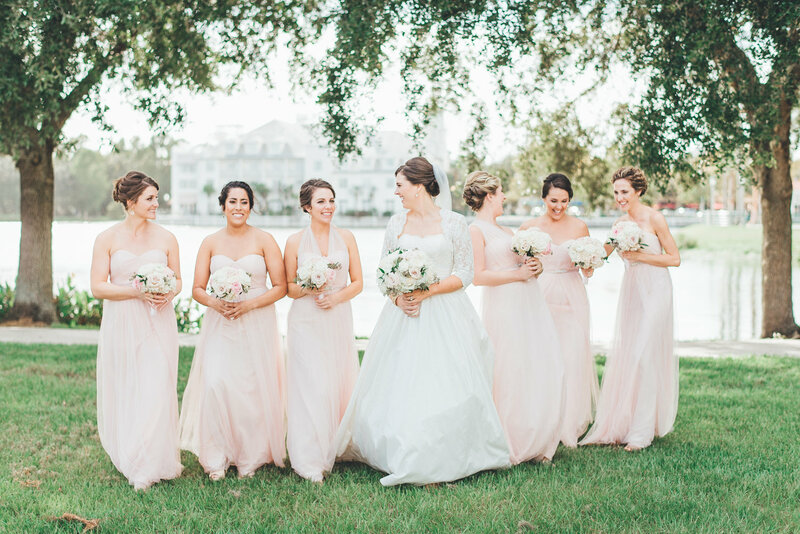 Blush by Brandee Gaar did a fabulous job – as always – keeping everything running smoothly to give Katelynn and Kyle the wedding of their dreams, while Collective by Concept was there every step of the way to capture it all for a lifetime. 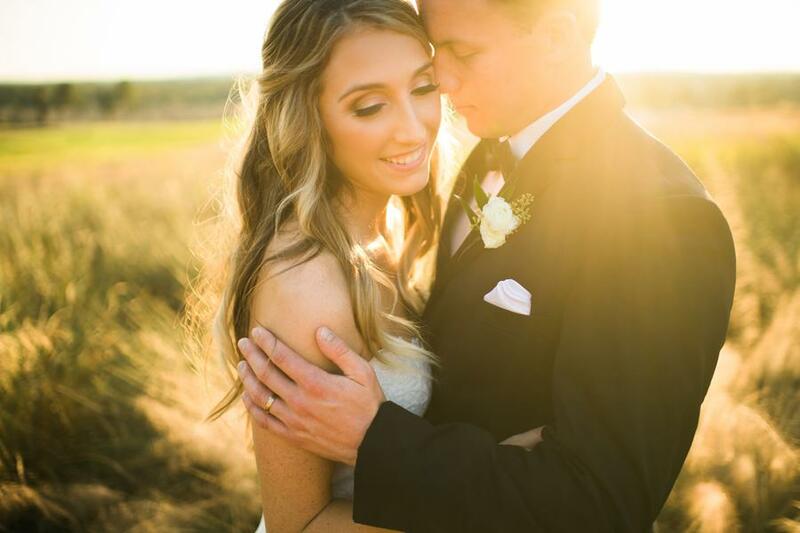 Katelynn made the most stunning bride; everyone turned to look at her as she walked down the aisle, transfixed by her smile and beautiful gown. 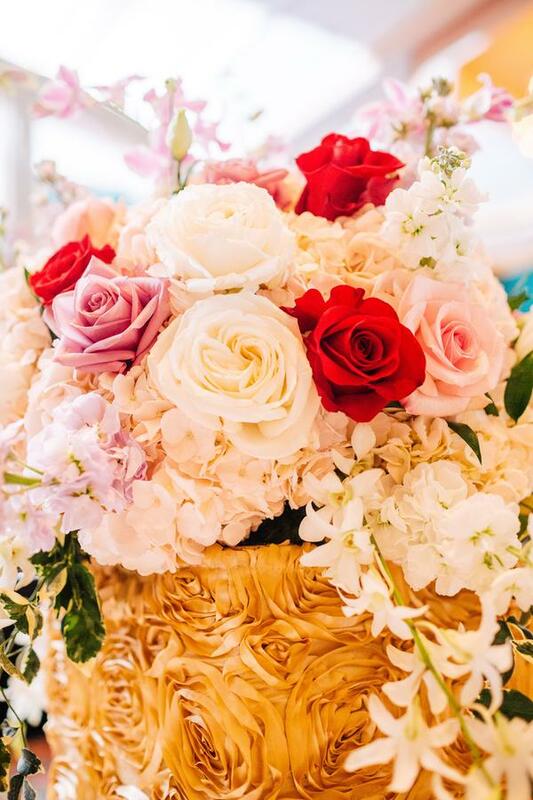 Her cascading bouquet had been lovingly crafted in a rich color palette of white, champagne, blush, and merlot wine. 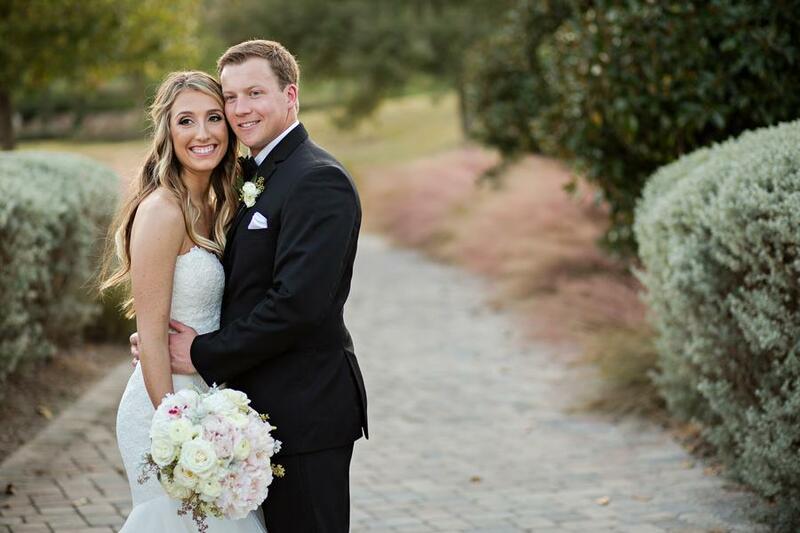 The bouquet popped against the ivory of Katelynn’s gown, full of lush hydrangea blooms, champagne and blush garden roses, merlot red ranunculus, deep burgundy dahlia, and hanging red amaranthus floral. 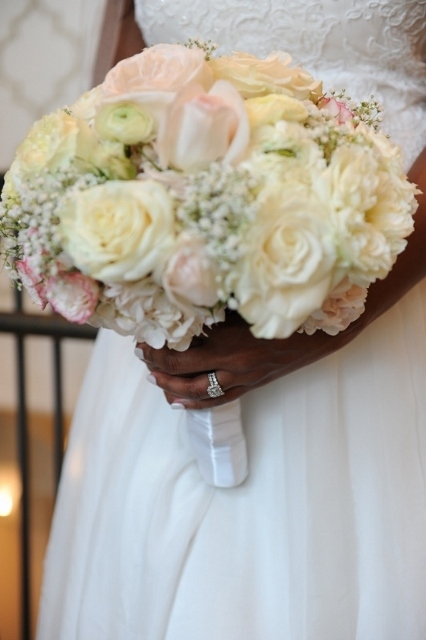 To finish out the bouquet, we added some seeded eucalyptus, dusty miller, Italian ruscus, and Italian pitt foliage. 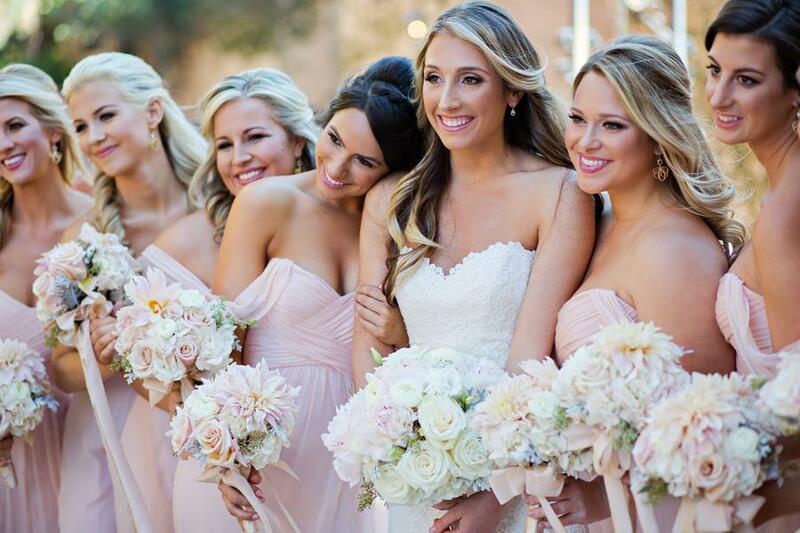 For Katelynn’s bridesmaids, we created elegant, hand-tied bouquets of white hydrangea with blush garden roses, soft pink ranunculus, dusty miller, and seeded eucalyptus. 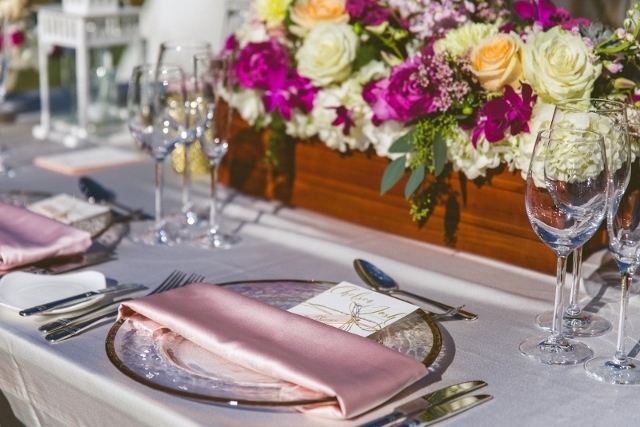 For a bit of softness, we added in some pink wax flowers. 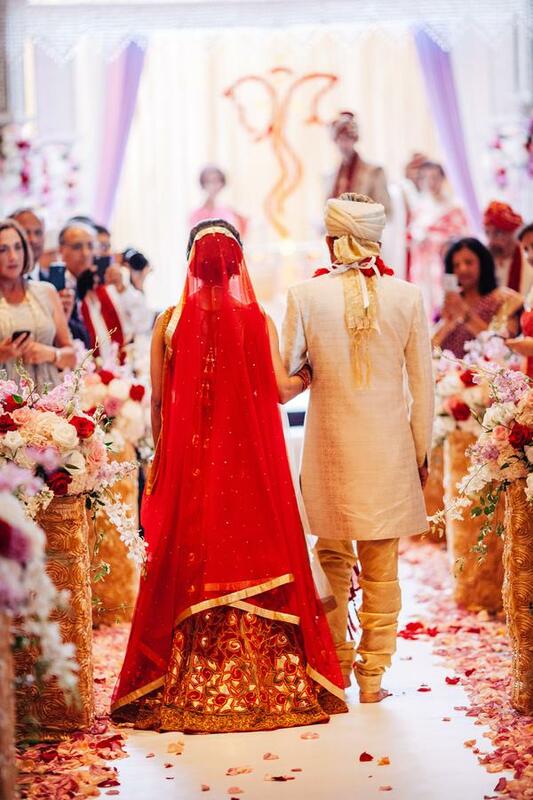 Of course, our groom had to match his bride! 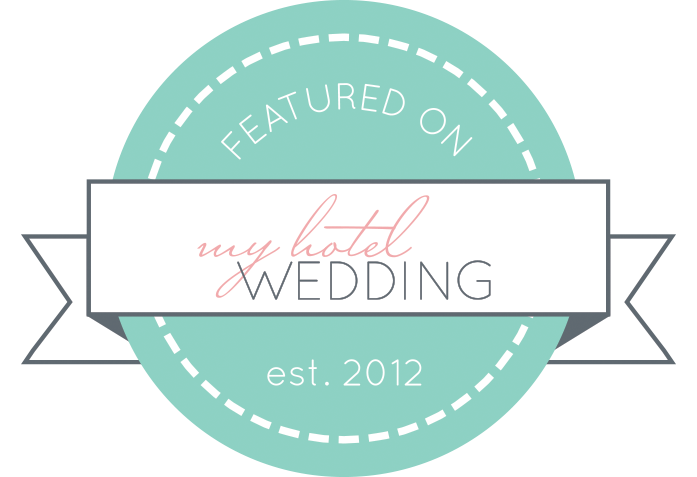 For Kyle, we created a boutonniere with merlot-red ranunculus blooms, dusty miller, and seeded eucalyptus. 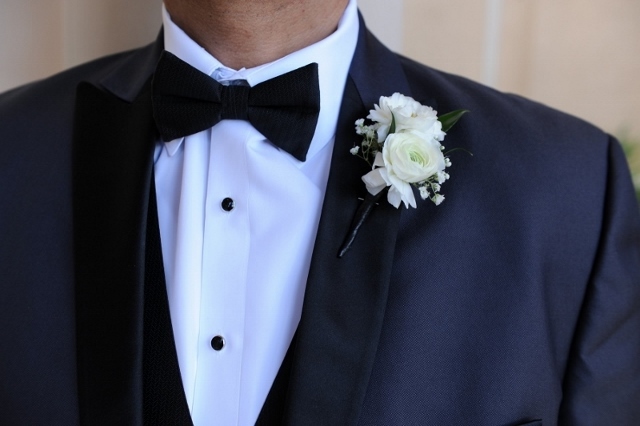 It was striking against his charcoal gray suit, making him so dashing! 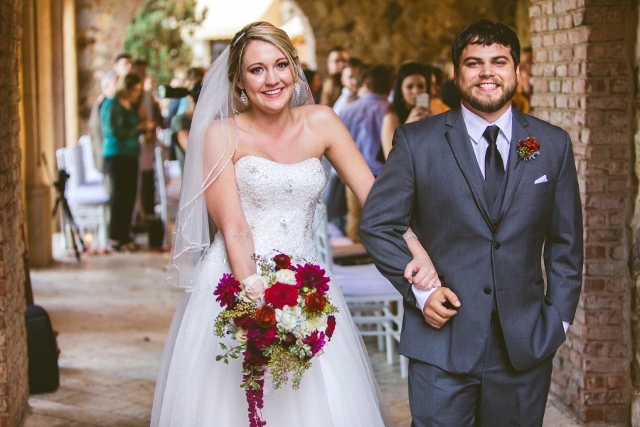 Everyone admired the couple throughout the ceremony, cheering as Katelynn and Kyle were pronounced husband and wife. 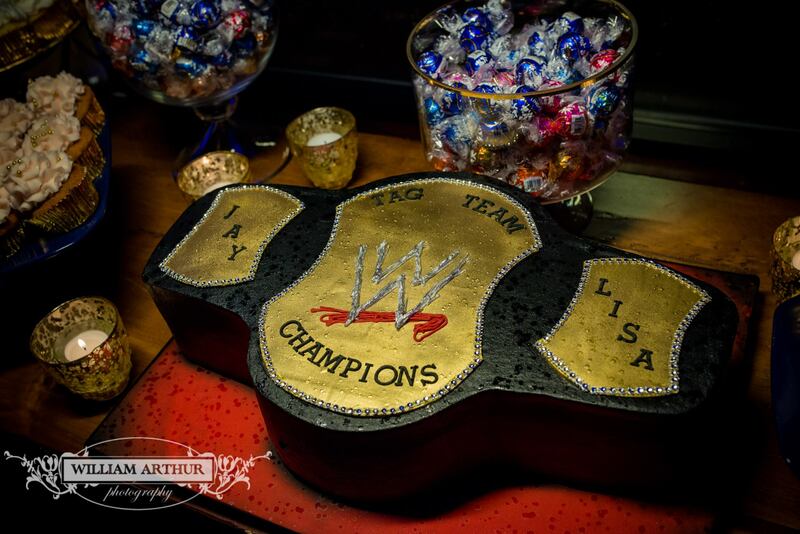 Soon after, it was time to kick off the party! 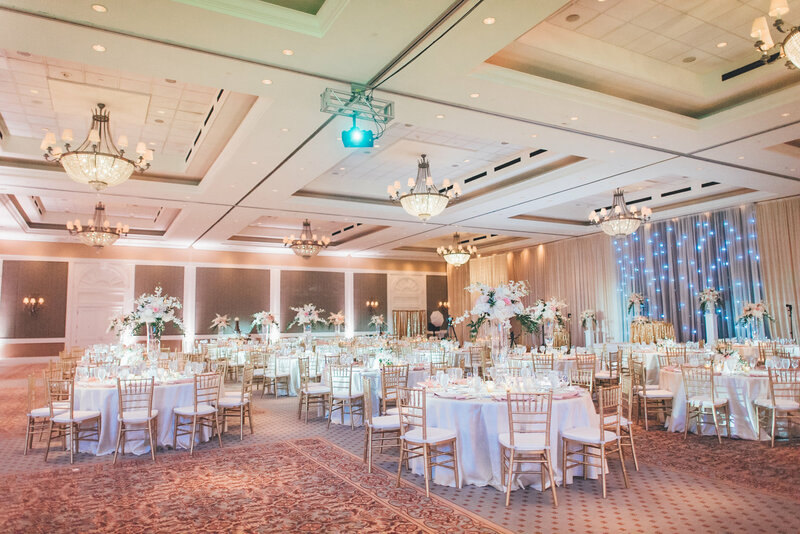 Everything was perfectly in place for the indoor reception, and everyone was ready to get on the dance floor! 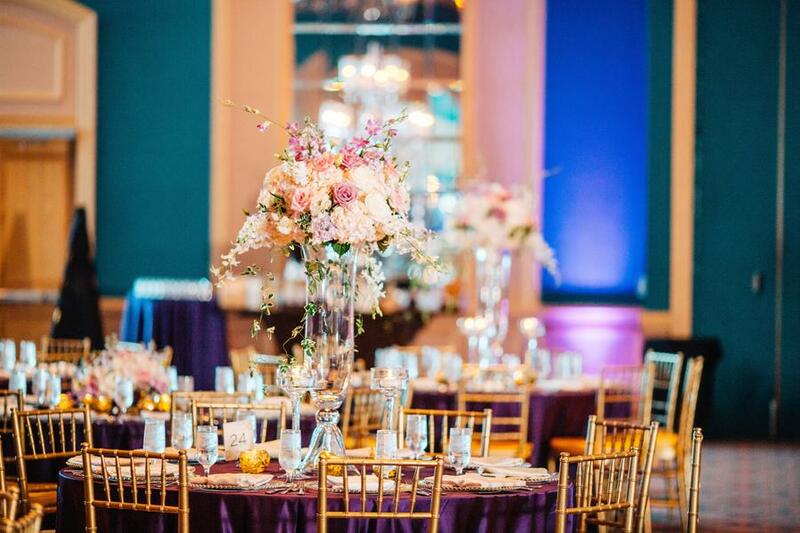 Katelynn and Kyle wanted their centerpieces to be stunning, but a little different, and we loved getting creative with the idea! 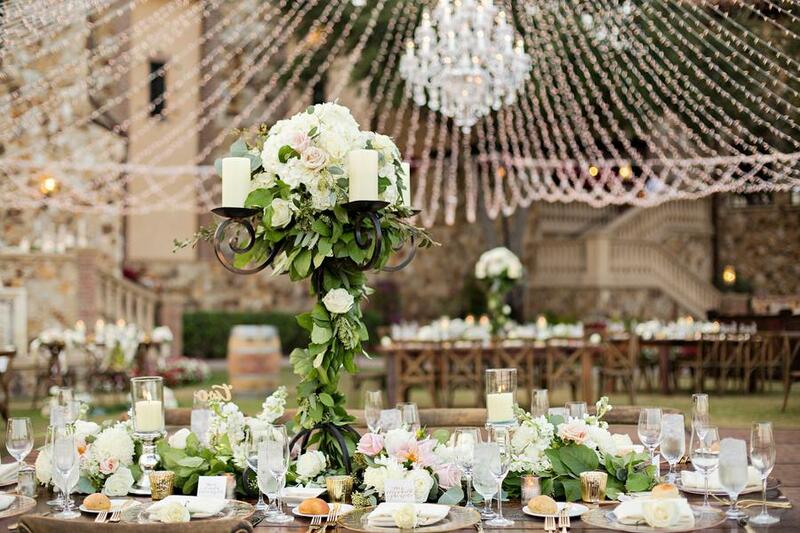 We crafted their centerpieces with our rustic wrought iron chandeliers, using a mix of the same flowers used in Katelynn’s and the bridesmaids’ bouquets plus a bit of foliage for a hint of a rustic touch. 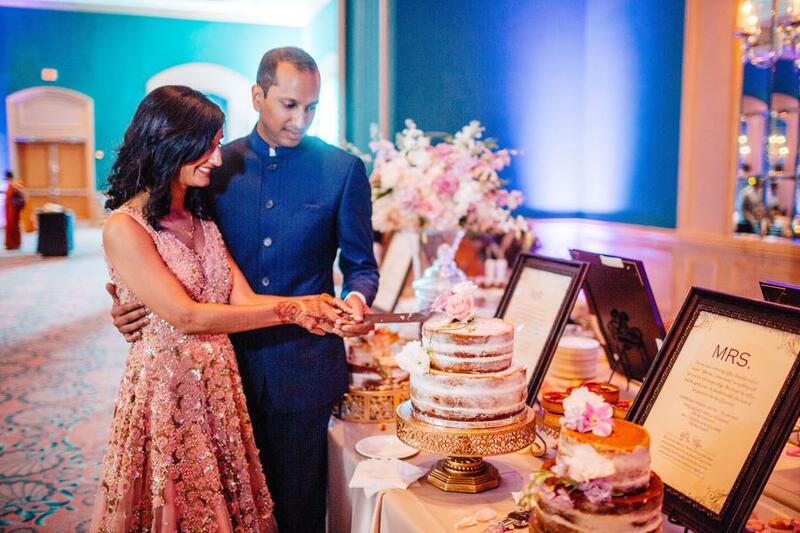 After hours of dancing the time away and making memories, the day came to a close, and soon, it was time to say goodbye to our couple. 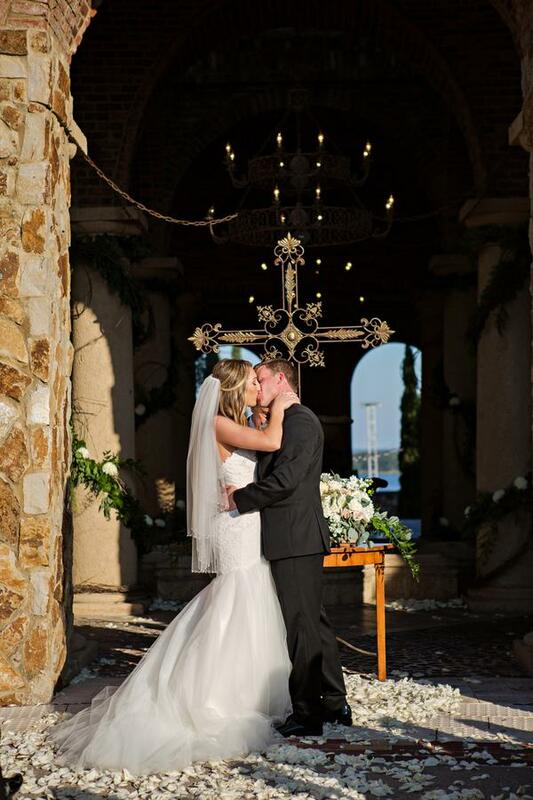 Congratulations again, Katelynn and Kyle! 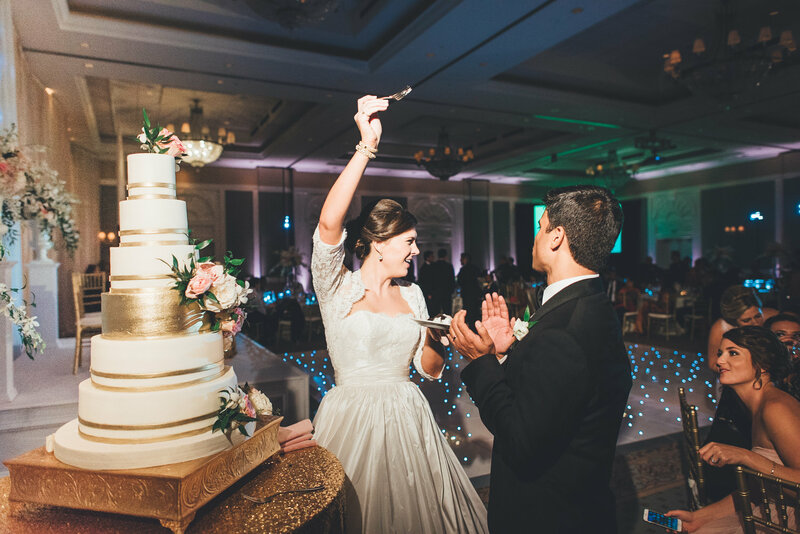 Every wedding is special, but Christina and Joseph’s Blush and Gold Wedding at the Reunion Resort was double the fun! 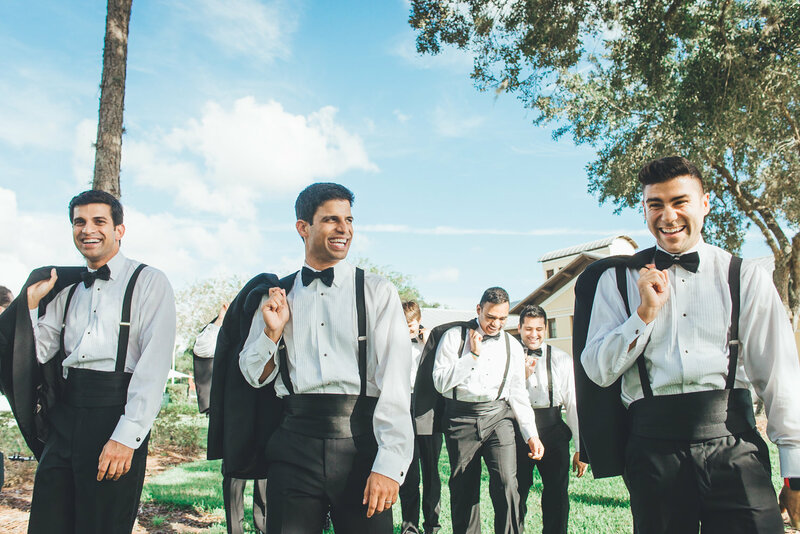 This wedding was an absolutely stunning two-day event, expertly planned by Blush by Brandee Gaar, with every special moment and detail brilliantly captured by Bow Tie Photo. 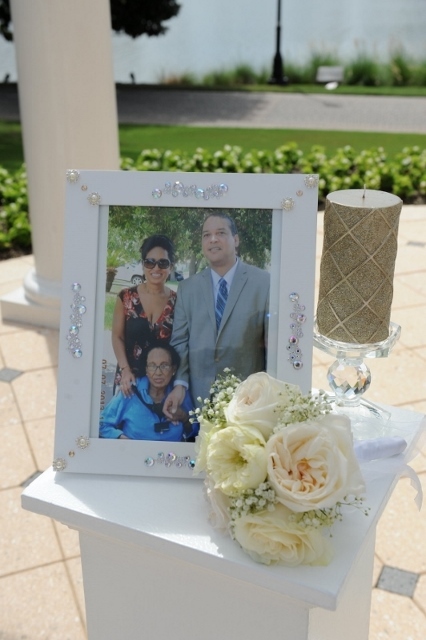 The ceremony at Corpus Christi Catholic Church in Celebration was simple, but memorable. 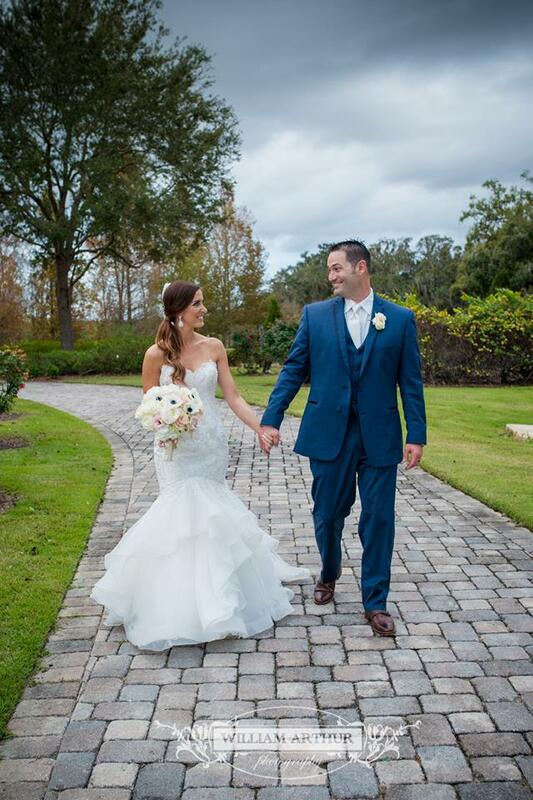 Christina looked so beautiful as she walked down the aisle, wearing a stunning gown with lace touches, her hair in a sophisticated updo. 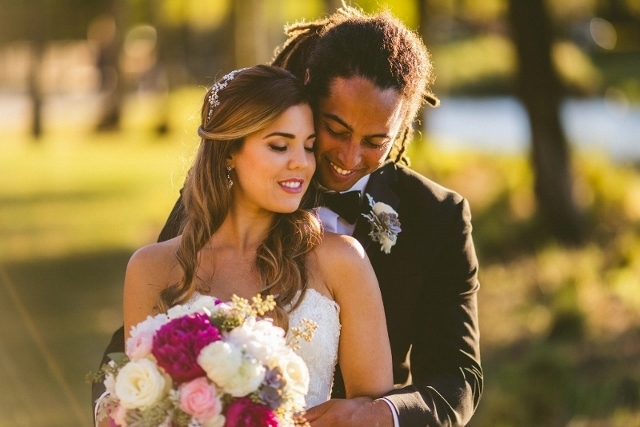 Of course, her bouquet had to be just as elegant to match! 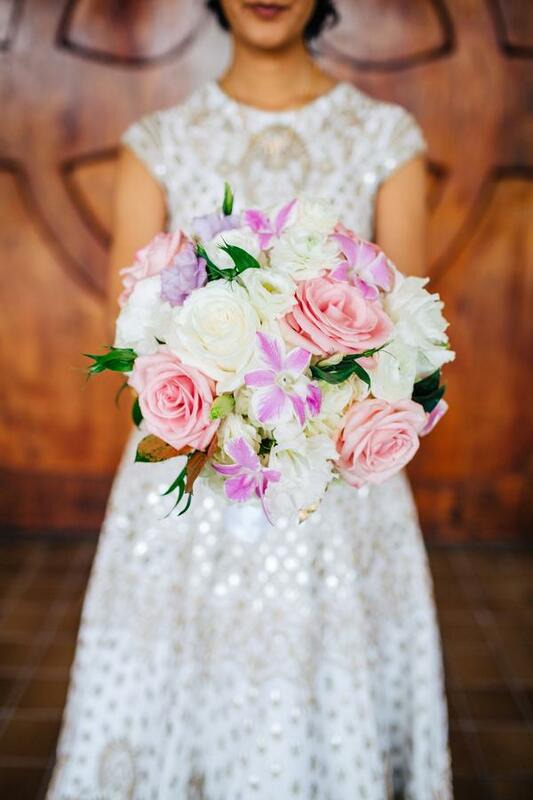 We created her beautiful bouquet with white hydrangea, accented throughout with open pink and white O’Hara garden roses, and cream and champagne roses. 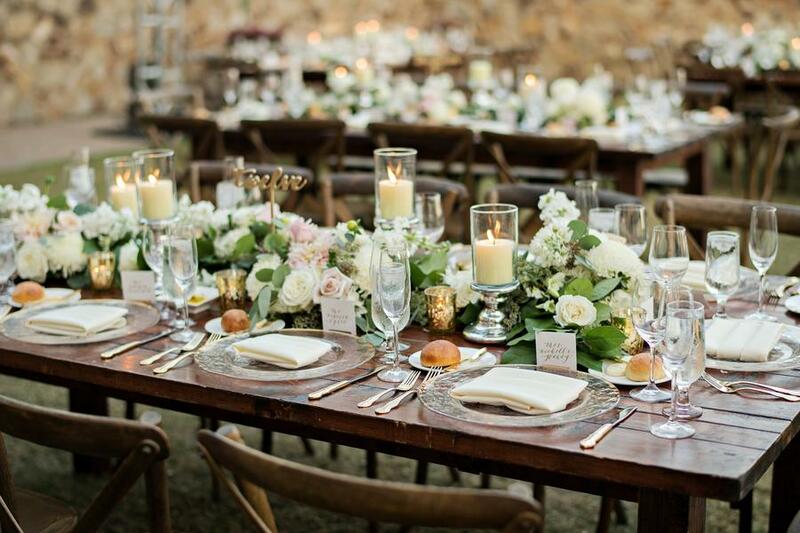 Soft touches of Italian ruscus and some seeded eucalyptus greenery for texture completed the arrangement. 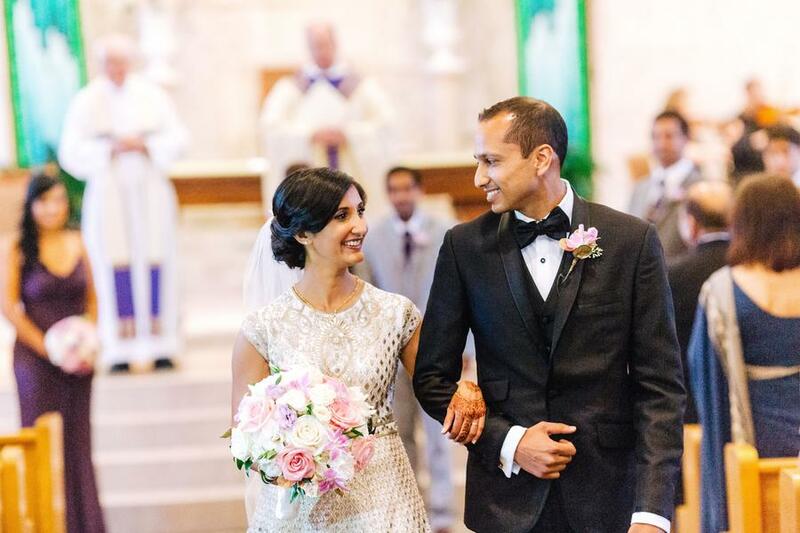 For Joseph, we crafted his boutonniere with simplicity and elegance in mind, using a white ranunculus to complement his bride’s beautiful gown. 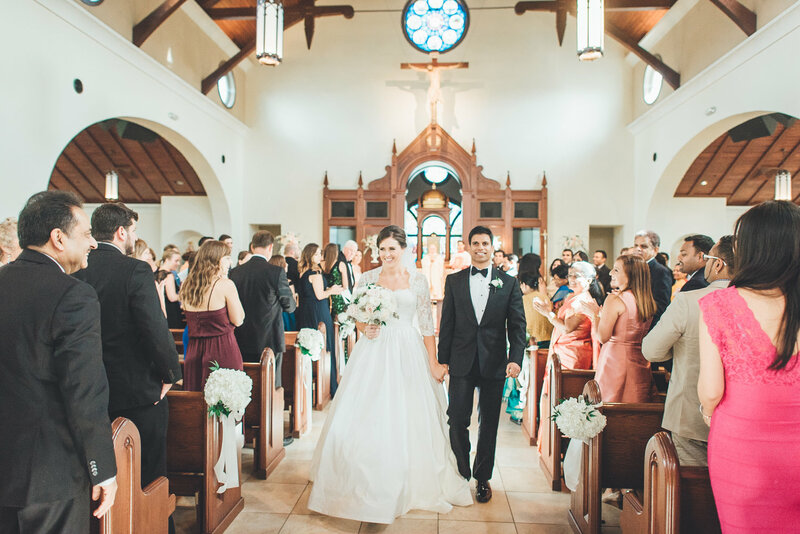 It was just so heartwarming to see Christina and Joseph stand together throughout the ceremony; they made such a beautiful couple! 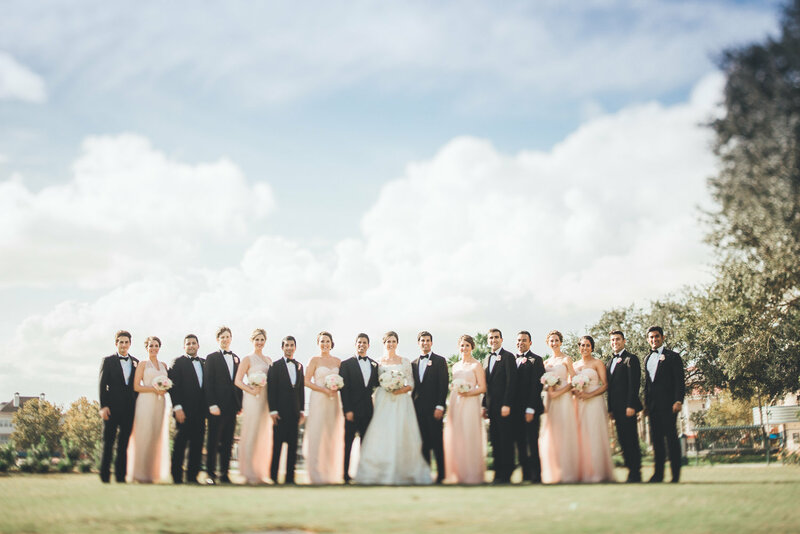 All eyes were on our couple, but the bridesmaids and groomsmen made quite a style statement as well! 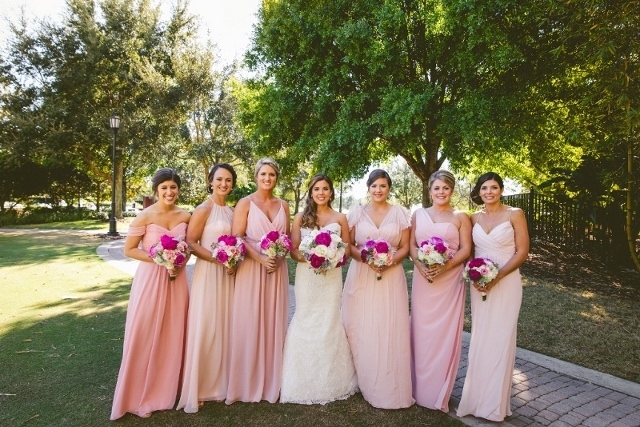 The bridesmaids wore the most lovely pale blush gowns, their bouquets created to match with blush ranunculus. 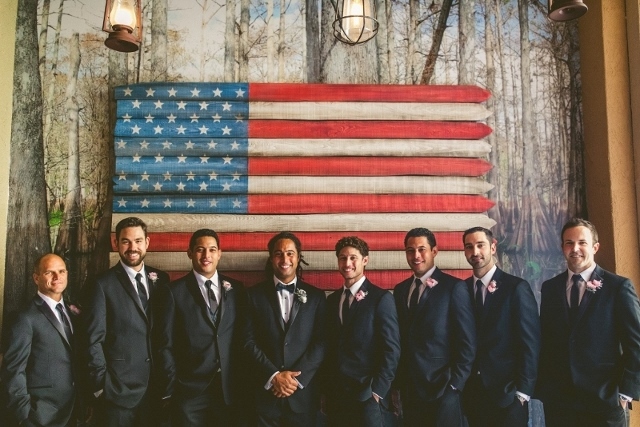 The groomsmen donned matching boutonnieres of pink ranunculus. 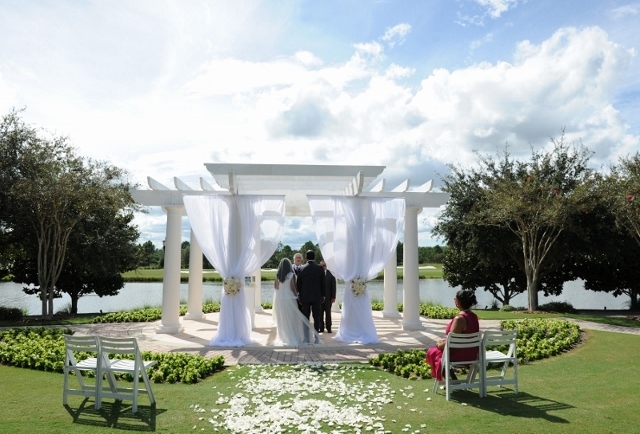 As beautiful as the ceremony was, the reception at Reunion Resort was truly breathtaking! 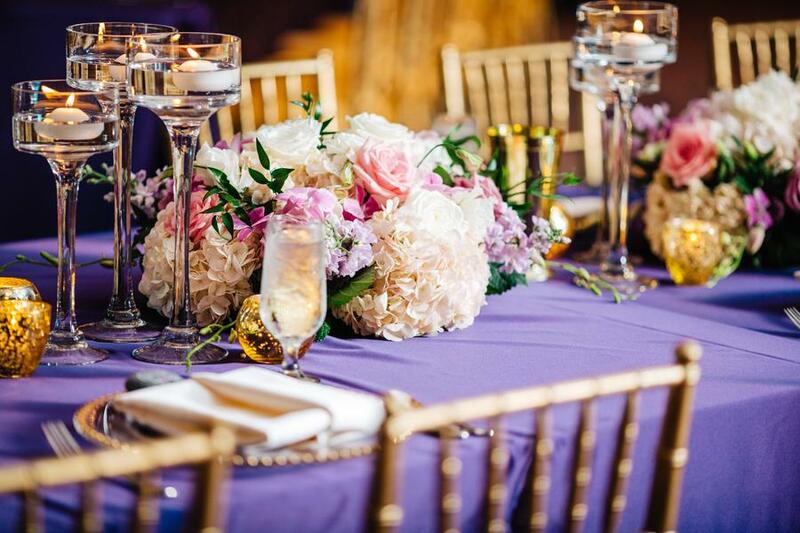 Shimmery golden linens added a regal look to the tables, perfectly paired with tall glass bell vases. 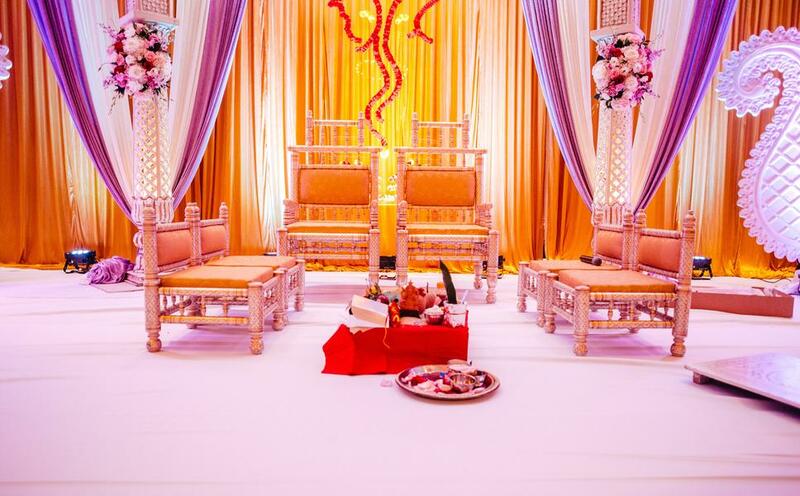 They towered high with lush bouquets of hydrangea blooms, open cream and blush pink roses throughout, with beautiful white orchids spilling out. 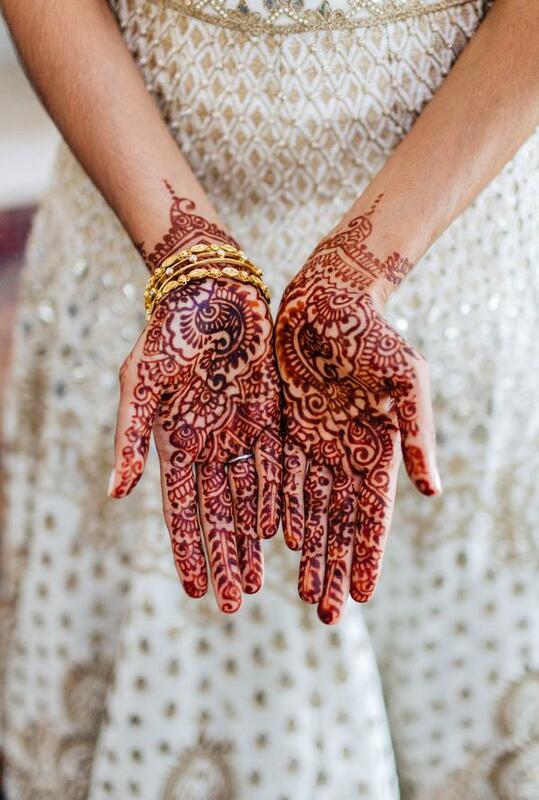 We even added accents of Italian Ruscus for color and texture. 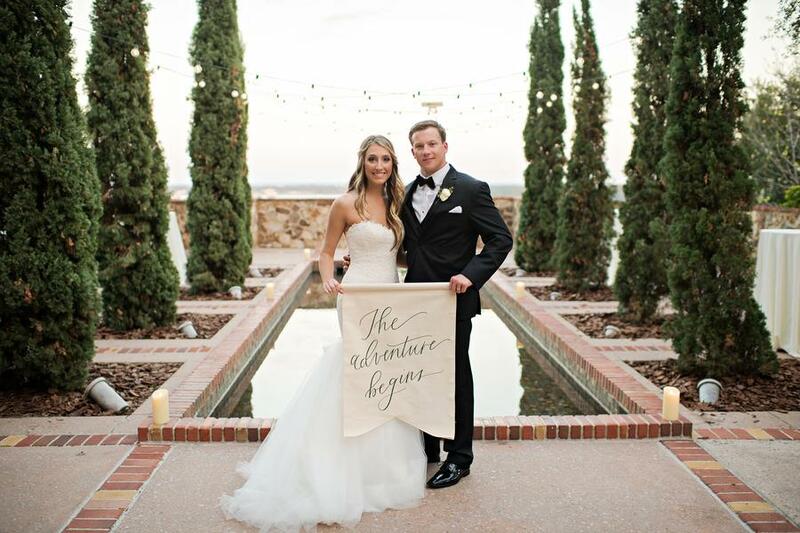 It all came together flawlessly, with everything a perfect fit for Christina and Joseph’s sweet and elegant natures. 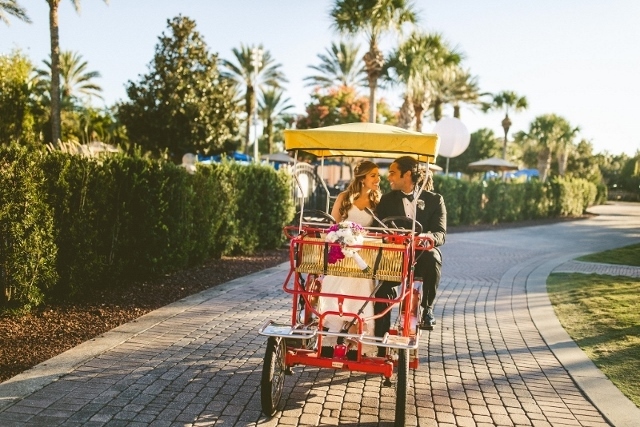 This Blush and Gold Wedding at Reunion Resort really was unforgettable! 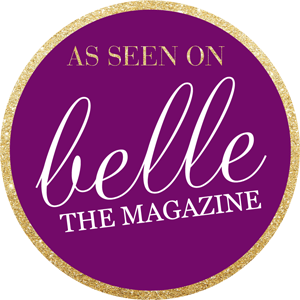 Sometimes, things don’t go exactly as planned, but there’s always a silver lining! 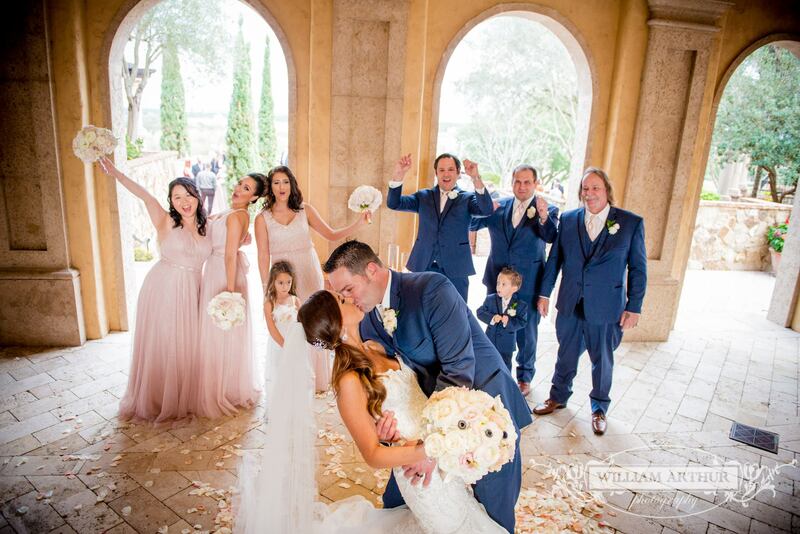 Lisa and Jay’s Luxurious Winter Wedding at Bella Collina was stunning, and it was beautiful to see two such loving souls come together! 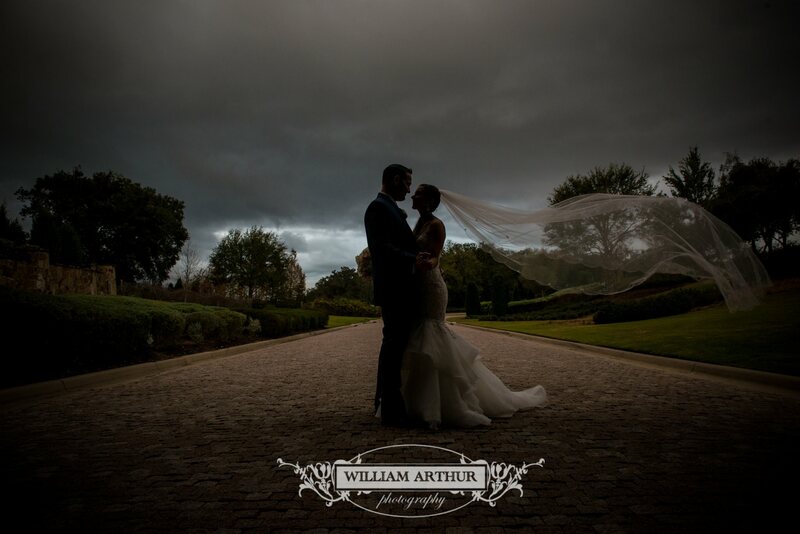 With Blush by Brandee Gaar at the helm, every detail of the day was unforgettable, with William Arthur Photography capturing it all for a lifetime! 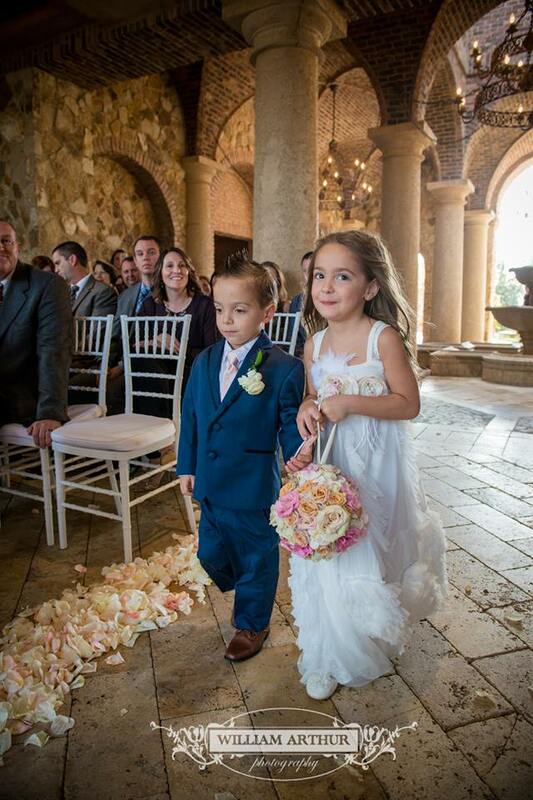 All eyes were on Lisa, a vision in white as she walked down the aisle. 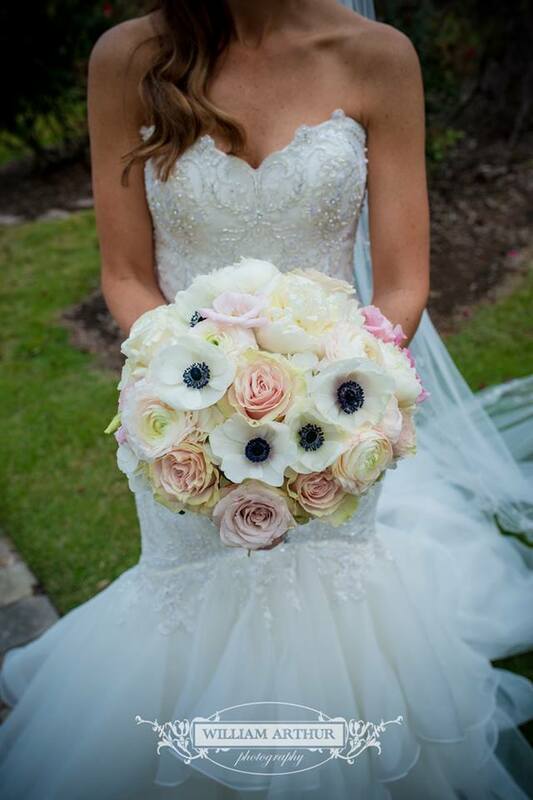 Her bouquet stood out beautifully against her gown, created with blush hydrangea, white peony blooms, blush ranunculus, lissianthus, pink garden roses and, for a bit of contrast, black-eyed panda anemone! 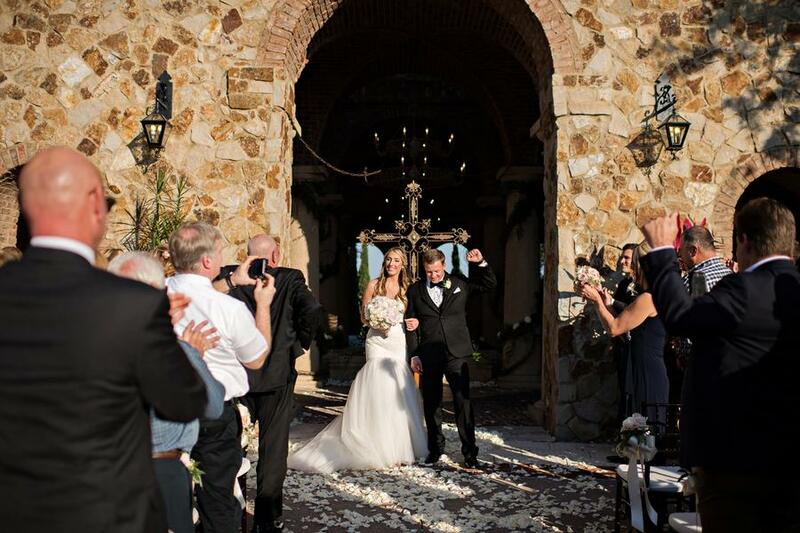 Jay looked very handsome in his suit, a big smile on his face as he watched his bride walk towards him. 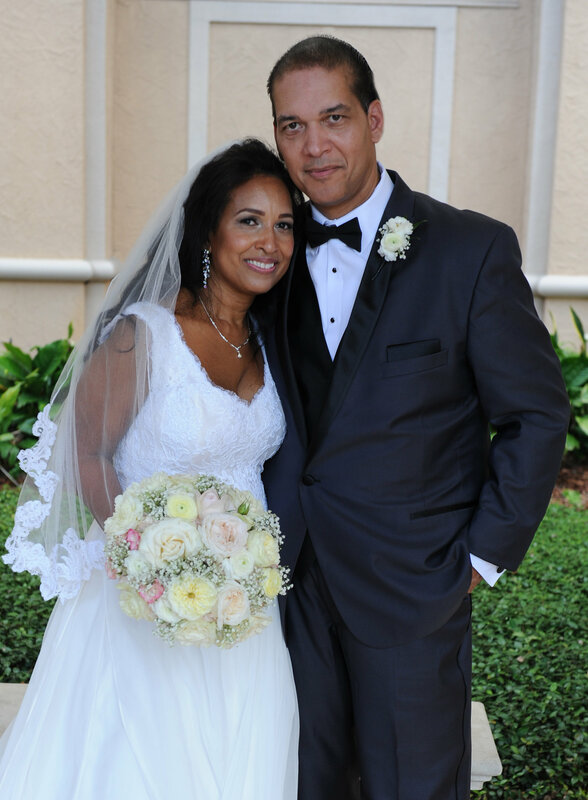 To match Lisa’s beautiful bouquet, we created Jay and the groomsmens’ boutonnieres with ranunculus blooms and Italian ruscus foliage for a simple but elegant style. 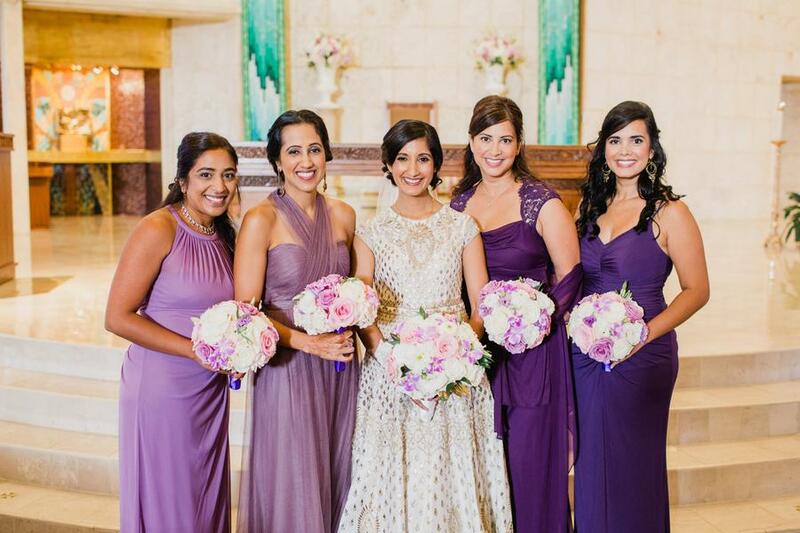 Of course, we didn’t forget about the bridesmaids! 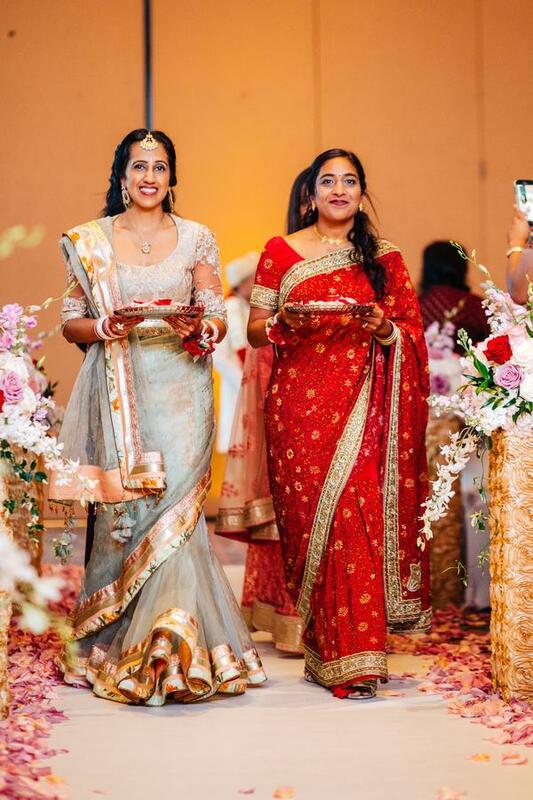 The ladies looked lovely in long blush gowns, their bouquets a perfect complement with their soft, romantic tones and textures. 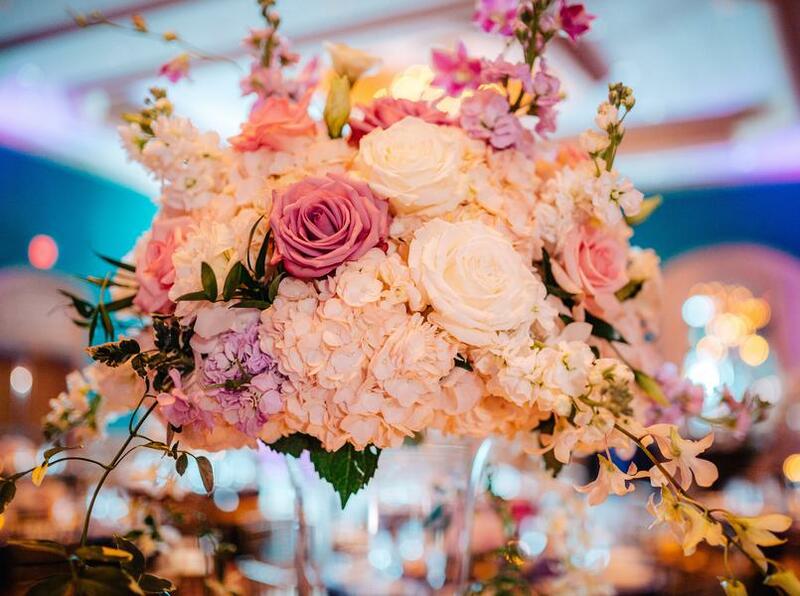 Blush pink hydrangea and open champagne roses accented with lissianthus and ranunculus created unforgettable arrangements. 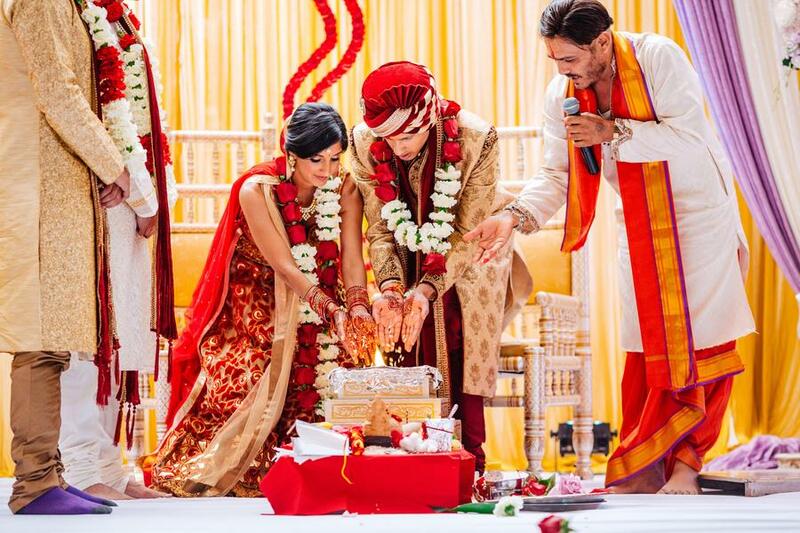 Shortly after the touching ceremony, it was time to celebrate! 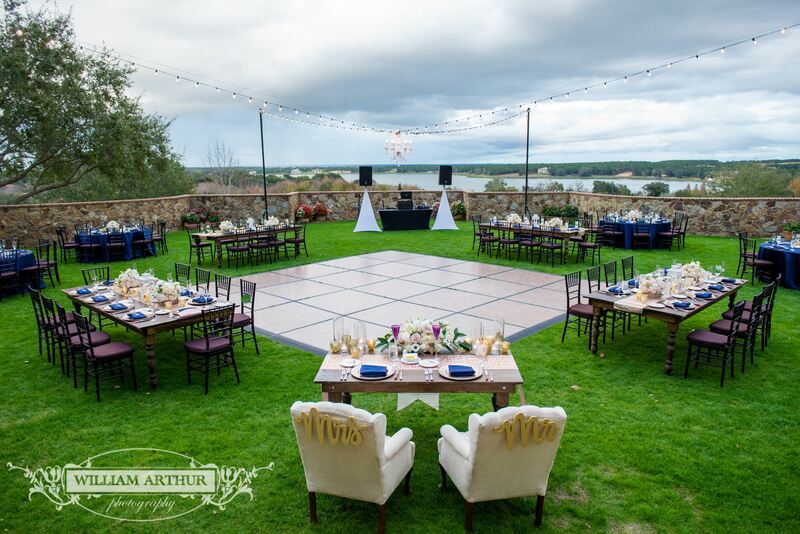 Unfortunately, a bit of rain drenched the outdoor reception area, but all of the amazing vendors came together to make sure that Lisa and Jay’s Luxurious Winter Wedding at Bella Collina would still be perfect! 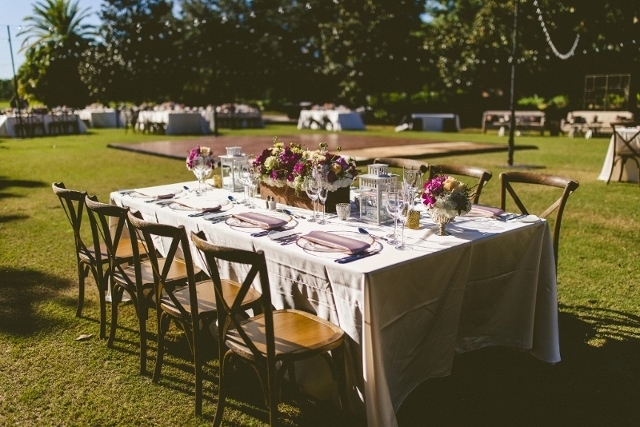 Sure enough, the reception was a stunning affair. 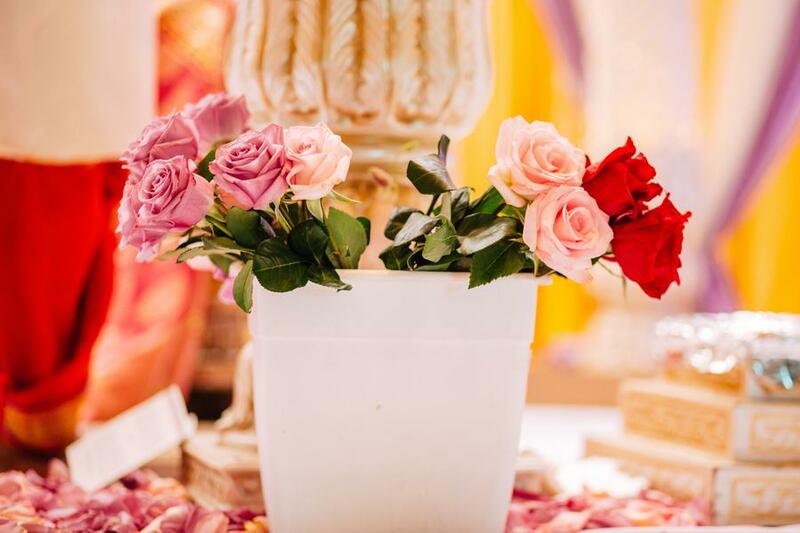 The tables were adorned with white-washed wooden vessels holding beautiful petite floral arrangements, all designed to match the bridesmaids’ bouquets. 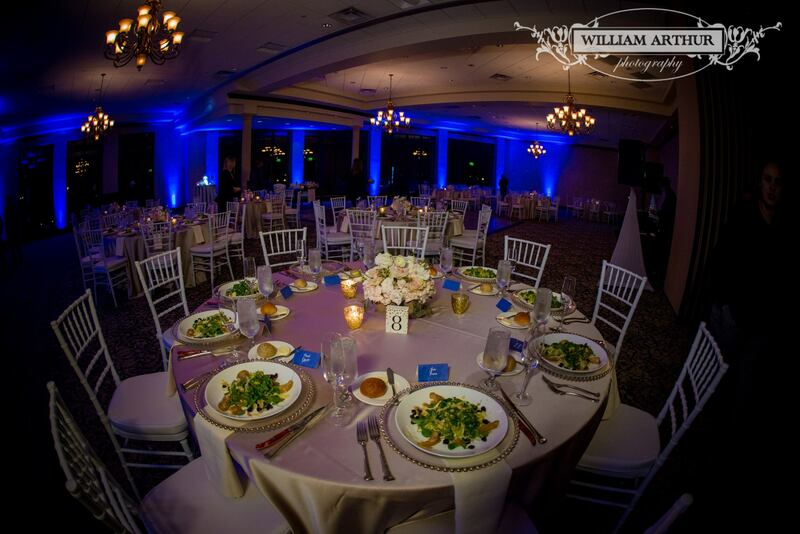 Royal blue linens on the tables and stylish black chairs completed the look, creating a totally unique yet timeless tablescape. 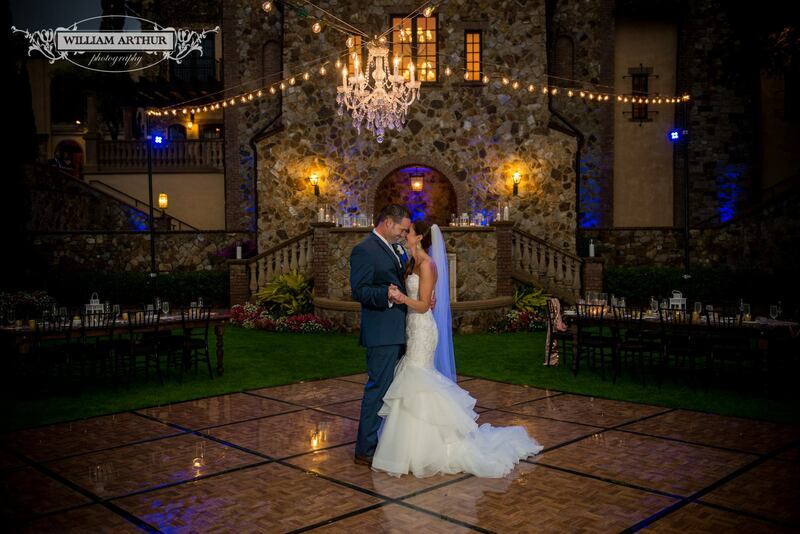 The dance floor had been soaked in the rain, but Jay didn’t let that stop him from dancing with his bride! 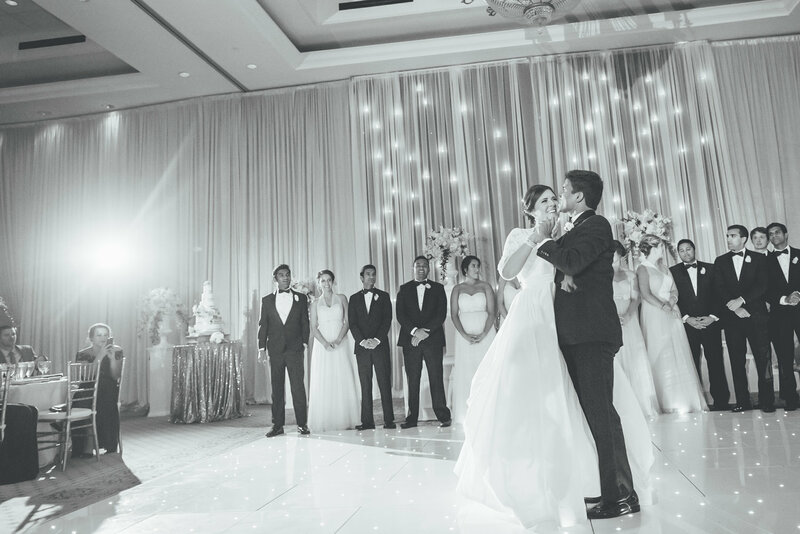 Their first dance might not have gone exactly to plan, but it made for some beautiful memories and gorgeous photos. 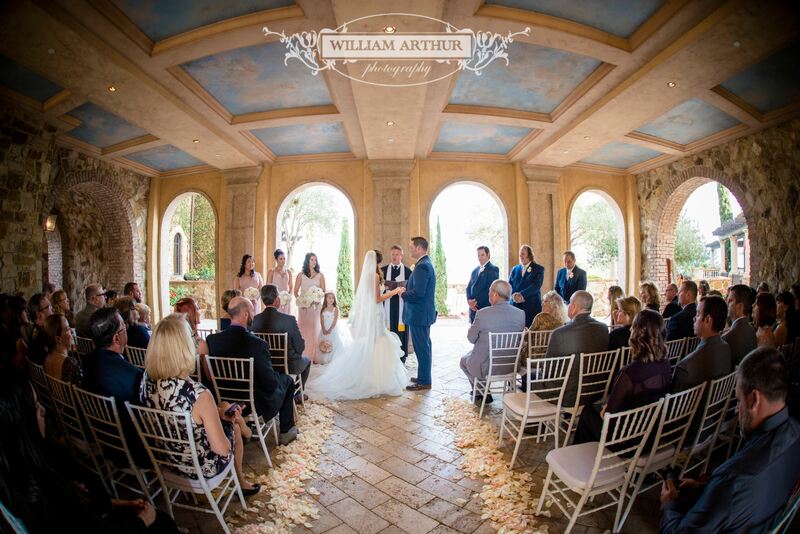 As with all things, this Luxurious Winter Wedding at Bella Collina eventually had to end, and everyone gathered to wish our newlyweds well as they left as husband and wife. 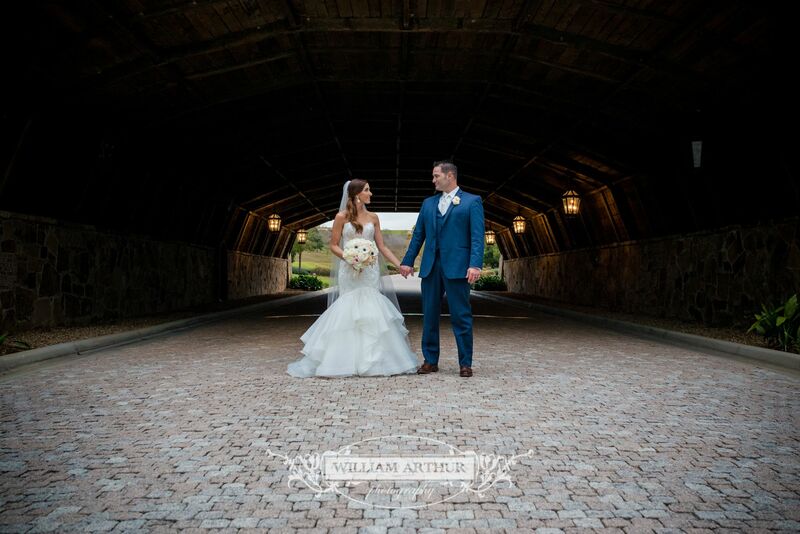 All weddings, big or small, are special, but Lisa and Brian’s intimate wedding at the Ritz Carlton Grande Lakes definitely struck a chord with us. 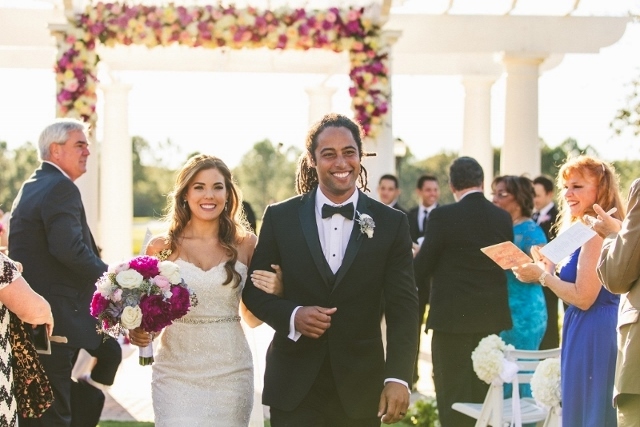 This couple is so special, and to be a part of their Big Day was such an honor for us. 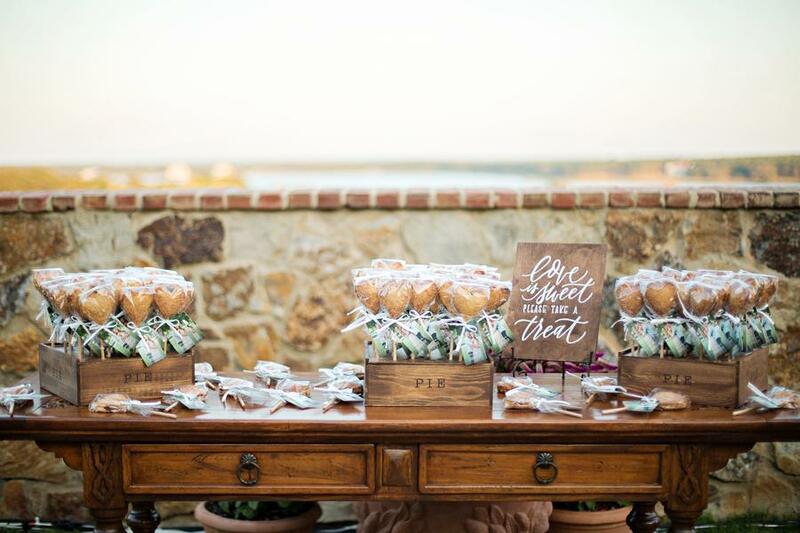 Expertly planned by Blush by Brandee Gaar and captured by Damon Tucci Photography, each moment of the day was absolutely perfect. 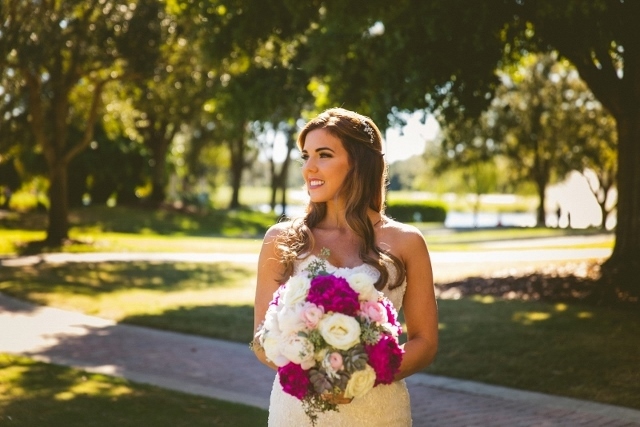 Lisa looked lovely as she walked down the aisle toward her groom, her hair in loose waves and her makeup natural. 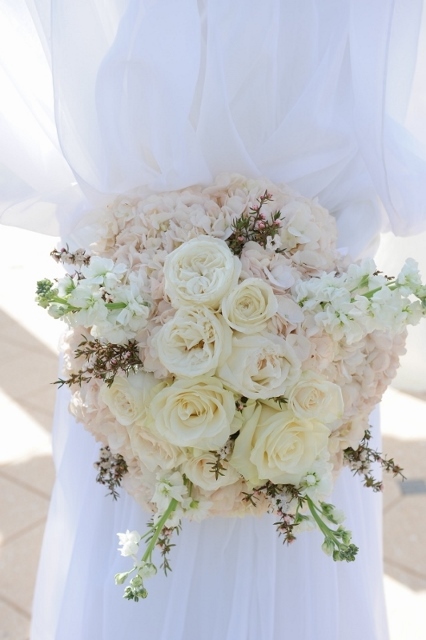 She carried a lovingly-crafted traditional bouquet, created with assorted roses in whites, creams, and soft blush blooms. 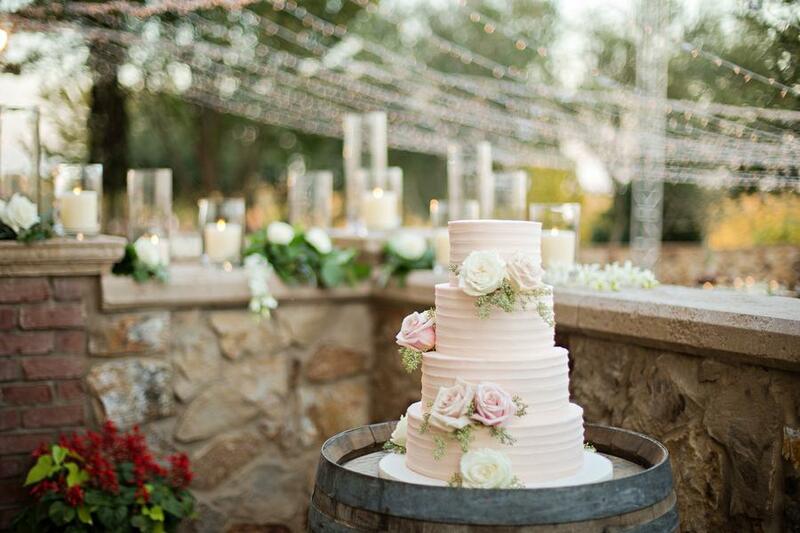 White and pink ranunculus added a bit of texture, while baby’s breath created the perfect accent. 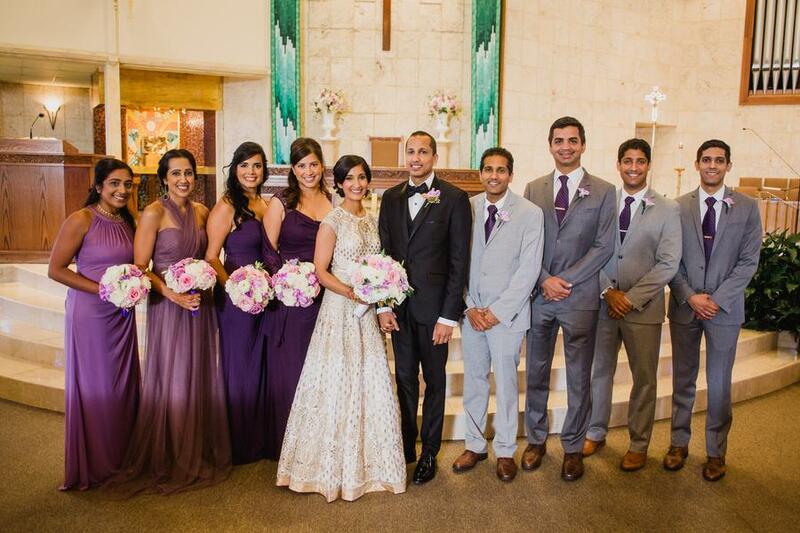 Of course, our groom had to match! 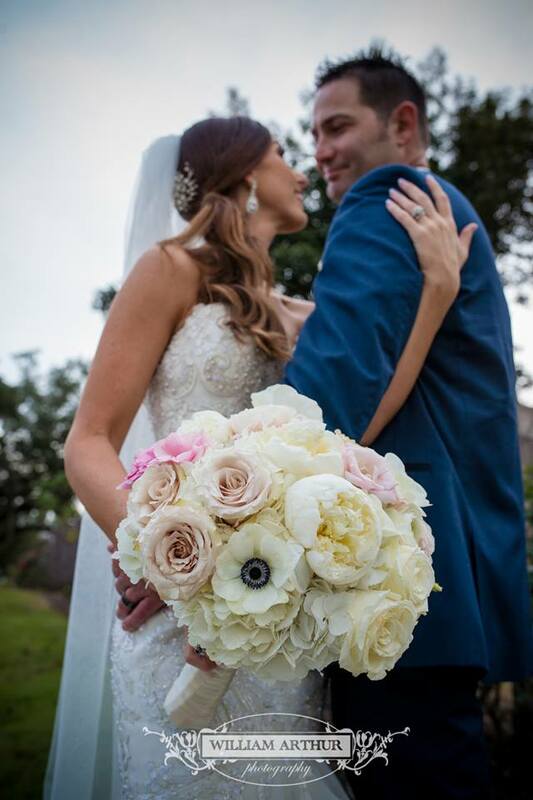 For Brian, we created a boutonniere with white ranunculus and baby’s breath, the perfect complement to Lisa’s bridal bouquet. 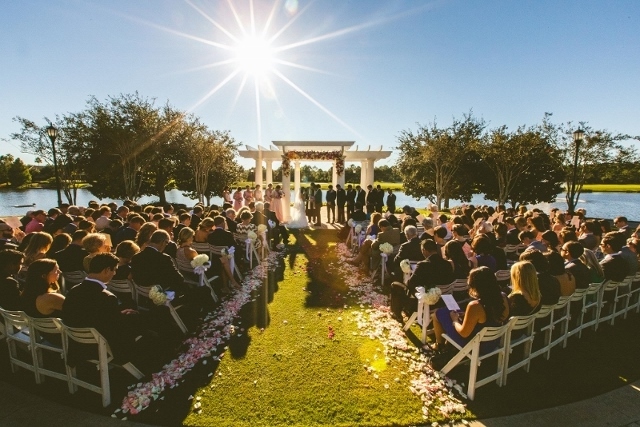 The pair married in a brief but beautiful outdoor ceremony. 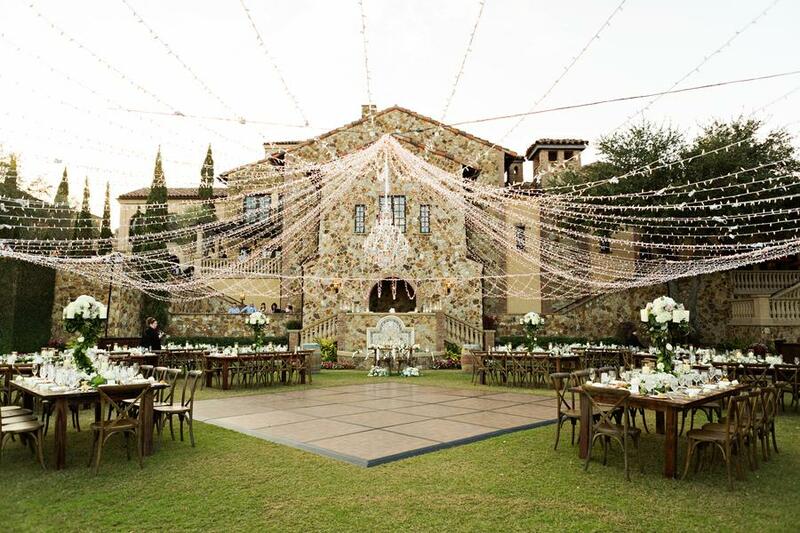 The Grecian pillars added so much romance and old-world sophistication! 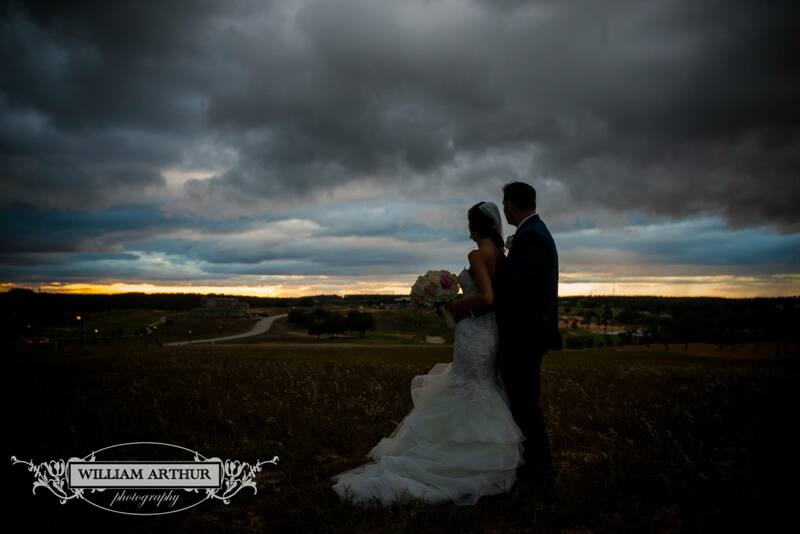 The day seemed to end all too quickly, but it was one we will always remember. 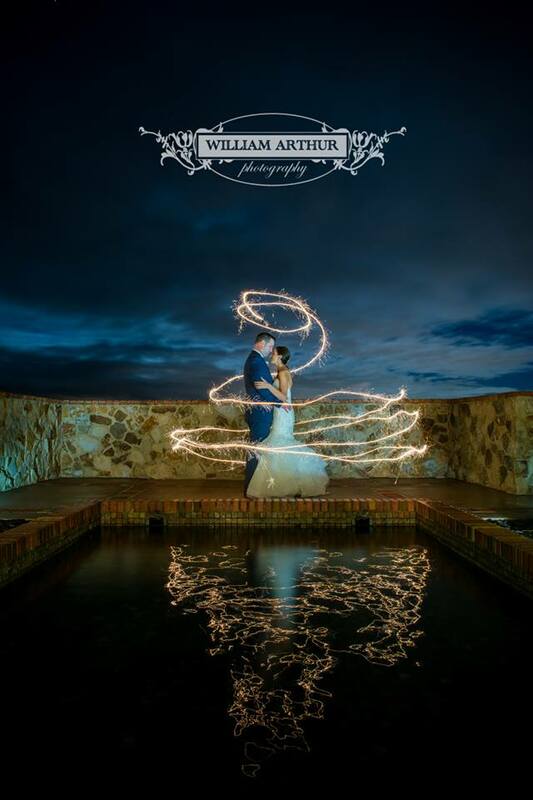 Congratulations once more, Lisa and Brian!